Over the years, I've managed to pick up a lot of information at the Purse Forum, thanks to the contributors there. I was thrilled to have the opportunity to glean helpful tips straight from the horse's mouth at the Hermes "Leather Forever" exhibition. 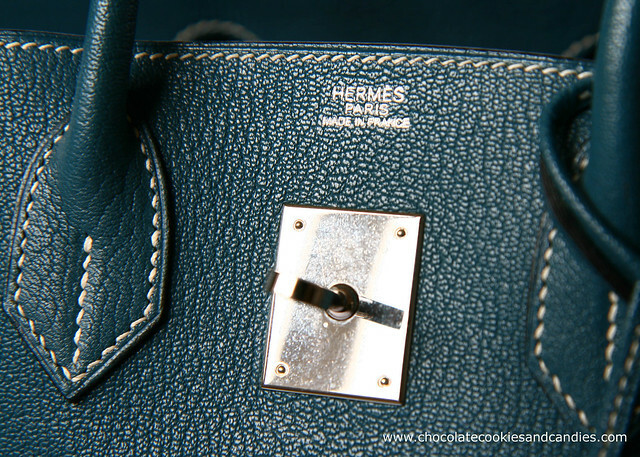 I've always wanted to know how to go about looking after my Hermes bags, to preserve their condition despite normal wear so that I can hopefully pass them on to the next generation. A huge thanks to the artisans for patiently answering my questions which I'm sure had been asked millions of times before. What's the most durable leather for everyday use? 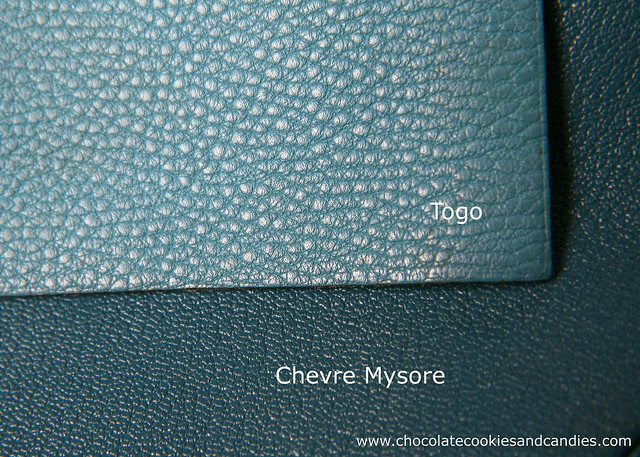 Togo because it's calfskin unlike taurillon clemence which comes from a mature animal (bull). The latter will soften more over the years and become rather slouchy. How should I store my bags? Do not store them in boxes because the leather will dry and crack over a prolonged period of time. Let them breathe. Stuff them with acid free tissue but don't stick them into dust bags. (I put mine in a bookcase which has glass doors so the dust won't get to them). What else can I do to ensure that my bags will last for decades? Do not expose them to direct sunlight, wind or rain (oops!). You have to use them but not everyday. Rest them.These bags are like shoes. You can't wear the same shoes everyday or you will wreck them quickly. I notice that parts of the bag (i.e. strap) is machine-stitched but for the most part, are hand-stitched. Why is that? We machine stitch for aesthetic reasons too. However, we hand-stitch in areas where there is most tension or pressure placed for durability. How often should I take my bag to "the spa"? Never! Well, as little as possible. The leather has been stretched, distressed and processed. The constant cleaning and conditioning will weaken the leather (I was under the impression that I have to send my bags in for conditioning ever few years). So did I. I guess it's good to speak to an artisan. Truly debunks all myths. If this applies to all leather bags then it's serious! I have to completely re-think my storage space. Aaargh! Your Thalassa B looks awesome - I still remember who you got the bag !! It was you that got me all crazy about chevre mysore. Especially, after seeing your black Birkin. Yeah, too bad I was well into my pregnancy to be allowed on the plane. Would've loved the experience of peeling open the tissues. You and I both. I still need to be reminded from time to time. Sniff, I don't think an Hermes bag will ever be in my reach, I would love a Kelly. I adore Kellys! I've seen secondhand Kellys going for pretty good prices but you'll have to be patient and look hard though. wow thanks for all of this info!!!! OOOPS....I'm taking mine out of the dustbag?? >< LUCKY you to be able to go to such a great informative exhibition!!!! so jealous!!!!!!! LOL! I think I went oops many times when I heard the answers. Sunlight - check. Wind - check. Downpour - umm... check. Thank you thank you! I'm loosening those dust bags now! Up until recently (3 years), I had them all in dustbags. oops. oh dear Marlene this is why I love your blog! i just learned alot!!! i'm ignorant when it comes to preserve and take care of my beauties! i just put them in their dustbags and take it to the top as my baby can't play or take it!!! now I know how I can manage it :) thanks for these tips dear!!! i also love the previous post.. lucky you've seen it!!! As long as it's a dust free environment (i.e. in the closet), it's ok to leave them out. LOL! I was happy for Lil L to "play" with my bags as long as there weren't any marker pens or scissors nearby. Hi Mona! Great to hear from you. Thanks for dropping by, Linda! It's great to hear from you. Really interesting! I wonder if these bags stay cleaner than other less pricey ones? (my concerns are always practical as my bags are always getting shoved under the table. ) Would love to test it out, if I could only pay for the H. That teal colour looks gorgeous. I don't think these bags stay cleaner. I suppose if you go for grainy leather and darker colors, the bags are far easier to maintain. Great and surprising information. I always thought it is best to keep your leather bag in its dustbag or perhaps the recommendation is strictly for Hermes bag? I always keep my Chanel lambskin in her dustbag now i wonder if i should remove the bag. I'd say this info applies to all bags. I've been told before that leather is an organic thing and needs to "breathe". I used to store my bags in their dust bags previously but constantly having to open and re-tie dust bags whenever I searched for the one I was looking for drove me crazy. Oh wow you have Hermes bags??? big admiration and swoons! So envious! I love that you keep them in a glass fronted cabinet! I'd love to see a photo....? I too keep all my bags in dust bags but I guess I won't be anymore! Great post Marlene and I loved the last one too, what a fantastic exhibition. Thanks so much for posting this. I keep my Bags in their dust bags and in the box. Didn't realize that wasn't good for them. Thanks so much for all the info. What a wonderful event to attend. It's wonderful to be able to ask questions at the event. I walked out with my head spinning due to info overload. Oh my goodness- the Togo leather really does age beautifully. Wow, I also thought bags should be stored in their dust covers in their boxes. I will have to remedy that asap. Thank you for sharing these tips! I failed yet again to get a Kelly this time. Sigh.. The bag and me are simply not meant to be. Oh no! I suppose it's not that easy getting a Kelly in Singapore. They're not that easy to come by. I've been keeping my eye out for a 32cm Etoupe (not that I'm REALLY looking for one). This is great info, thanks for this! Great tips that I'll be sure to use with my other bags too! Eek, I've been sticking them in their dust bags on a shelf forever - will need to let them breathe. Marlene! Thank for the tips!! I knew SOME of them, but not about the spa! And definitely something new about the dustbag - mine are all in a dustbag!! So, I must change that quickly! So good to know!